If you ever visit Washington State, take also the time to tour Northeast Washington, which looks totally different than the Pacific side. Northeast Washington’s terrain was created by cataclysmic Ice Age Floods and left a deeply scarred plateau with hundreds of small lakes, flat top mountains, and canyons known as “coulees” (ravines and ancient basins of waterfalls, some still holding water). Last week I took a few days off and toured this area with Kari. Though I had visited the northeastern part of Washington once before with George on a weekend sightseeing tour in September 1997, I always wanted to tour this area again because of its unique awe-inspiring landscape. It not only exists of long stretches of uninhabited majestic table mountains as well as small and large lakes, but also the famed massive Grand Coulee Dam, which you can tour. Additionally, on weekend evenings a laser show is hosted along the dam telling the story of the land, its people, and the creation of the dam. Like last time we were on the road again for 2 1/2 days. From I-5 we took Hwy 20 East, stayed overnight in Winthrop, where we also visited the Shafer Museum that houses several historic buildings with many authentic displays dating back to the late 1800’s. Winthrop is located in the Methow Valley, which is Washington’s equivalent of the Old West. As you drive up the valley, you’ll pass fields of baled hay, big old weathered barns, horses and cattle. 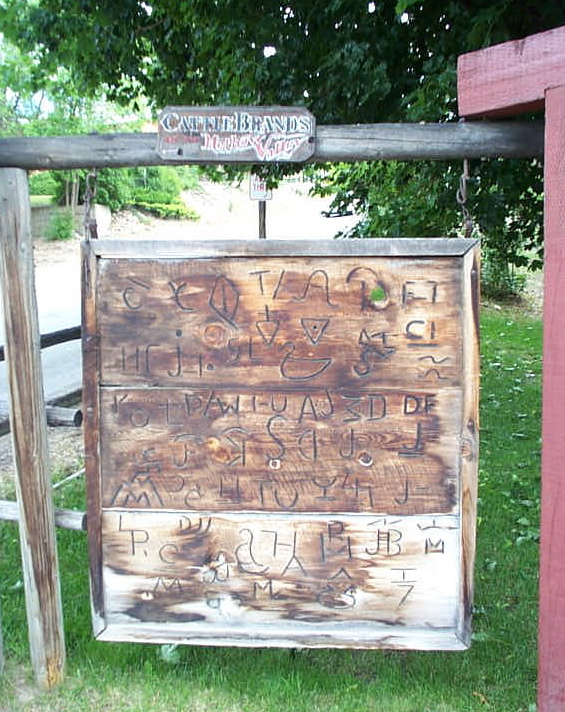 The sign below is located in the town’s center and displays past and present cattle brands. We continued our trip on Hwy 20 and 155 to Coulee Dam, where we stayed overnight and watched the laser show at the dam in the evening. The next day we drove South on Hwy 155, 17, 28 and 283 to Vantage on I-90, where the Gingko Petrified Forest and an interpretive service center is. Along the way we stopped at the humongous Dry Falls with its awe-inspiring landscape and view and Soap Lake. It was a great sightseeing trip and pictures of this tour and some additional tourist information are posted under the page Out & About, too. This entry was posted on Sunday, July 1st, 2007 at 6:14 pm	and is filed under Dry Falls, Gingko Petrified Forest, Grand Coulee Dam, North Cascades, Northeast Washington, Pacific Northwest, Travel, Winthrop. You can follow any responses to this entry through the RSS 2.0 feed. Both comments and pings are currently closed.